The Baglietto shipyard has launched a 41-metre yacht featuring a high- performance gliding bottom, built for a well-known Italian fashion designer. The yacht, which has three decks, is made entirely of aluminium. Its two powerful 3,700 HP MTU engines, its waterjet and its gliding bottom enable the Baglietto yard's 41-metre yacht to reach the remarkable speed of 35 knots. The design of the outside of this new yacht is the work of architect Tommaso Spadolini, while the interiors were created by Studio Gagliardi. 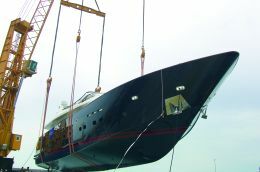 According to the yard, they have already sold the second 41-metre yacht, which will be delivered in the summer of 2005. A few outer details will differ slightly from those of the first version, while Ivana Porfiri has taken care of customising the interiors in accordance with the customer's taste. Starting in the summer of 2006, the Marina dell'Orso at Poltu Quatu (Sassari)will also be able to accommodate boats of up to 23 metres. The re-organisation of the facility became necessary in order to respond effectively to the growing demand on the part of owners of super-yachts who like to spend their holidays in the north-eastern part of Sardinia. Once the works have been completed, instead of the current 460 boats, the Marina dell'Orso will only be able to accept 252, but larger, that is to say 29 up to 15 metres, 58 up to 16, 51 up to 18, 32 up to 20, 19 up to 22 and 44 up to 35. The re-structuring also involves the area on shore, as the work in progress which led to the construction of the prestige Hotel Melià and the new flats overlooking the docks continue. 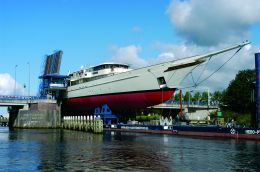 The Italian Mondomarine shipyard has recently completed the refitting of the period motor-yacht "Over The Rainbow", which has been delivered to its owner, the Belgian artist Jean Michel Folon. The "Over The Rainbow" is a 34-metre motoryacht built in 1930 by Dickie & Sons of Bangor, North Wales, and was launched originally as the "Janetha IV". To restore the original splendour of the old structure of this yacht, Mondomarine had to replace some of the frames and strakes of the planking, check and repair both the quick-work up-side and to caulk the hull using a traditional method. Mondomarine also altered the superstructure, extending the stern end of the flying bridge, while the interior layouts were completely redesigned by the Genoa-based firm Sydac to bring them into line with the owner's demanding requirements. 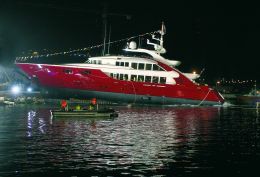 The yard made spick and span, a crowd of guests and a fireworks display provided a fitting scenario for the night-time launching of the super-yacht "Ellix Too", a 47-metre yacht built by the ISA yard in Ancona. It has a steel hull and aluminium superstructures, and its displacing bottom, driven by a pair of 2,774 HP MTU's, reaches a maximum speed of 17 knots. At first sight it is characterised by the unusual red colour of the hull and the special "tong-shaped" design that is a peculiar feature of the stern, while the rest of the superstructure is cream-coloured. Obviously, since the boat was custom-built, the layout of the interior and the type of outfitting adopted are quite different from those of the first of its type, the "April Fool", launched last year. Welcome, "Ellix Too", new queen of the seas and the umpteenth example of the high quality standards reached by Italian boat-building also in the field of large metal yachts. The Posillipo-Rizzardi presented its new Technema 95 motoryacht on 12th June in San Felice Circeo (Latina). The design of this new model was entrusted to the pencil of architect Carlo Galeazzi, who created contrasts between his soft shapes and sharp corners, in line with the newest styling trends. With the Technema 95 the Posillipo yard intends to make a name for itself in the field of boats of over 90 feet, and considering the comments that greeted this first specimen as well as the orders on which work is in progress, it's not difficult to say that they were right. 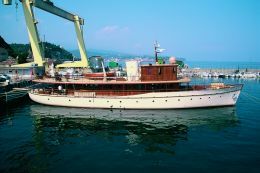 The eighth model of Codecasa 50, called "Andale", built by the Viareggio shipyard for a United States customer was launched late in July. This new motor-yacht will sail in the Mediterranean this summer, after which it will cross the Atlantic bound for the Caribbean. The Codecasa 50 motor-yacht has four decks linked by means of a handy lift. The outside features plain but strong lines and the luxuriously furnished interiors were designed by architects Franco and Anna Della Role. A new harbour for superyachts has been built in Lacco Ameno, on the island of Ischia (Naples). The pier is all of 107 metres long and can accommodate craft ranging from 20 and 90 metres in length. 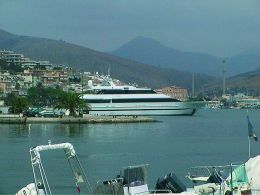 The new harbour in Lacco Ameno, named Heaven's Quay, was badly wanted by the mayor Domenico De Siano who, together with the company Yachting.it that manages the facility, made it operational in July, guaranteeing a modern, safe and well-equipped landing place in the area of the Gulf of Naples. In July Fipa Italiana Yachts launched their new "Maiora 38 DP". It features the unmistakable design recalling the lines already proposed on their smaller models. The Maiora 38 DP has three decks plus a flying bridge. The lower deck contains the sleeping area, with the owner's suite, five cabins for guests and three for the crew. The main deck includes a lounge, a dining-room, a bathroom, the galley and an area in the bows for relaxing. On the upper deck are the modern bridge, while the flying bridge houses the second control station, an area for relaxing with a table and cushions for sun-bathing, and a platform for the tender. 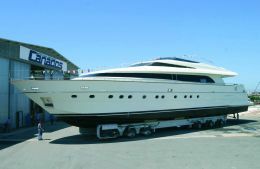 Three more Maiora 38 DP's are already being built of what is currently the leading model in the range, although it is due to lose its status as flagship next year to the "Maiora 43", currently also being built. 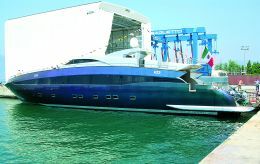 On 11th June the Canados yard in Fiumicino (Rome)launched its new "Canados 110" motor-yacht. It was placed in the water in the presence of a large crowd of guests, including the owner with his friends and relatives and the press. The ceremony took place according to tradition, with a speech by the owner, a buffet for the guests and the naming of the yacht with a bottle of champagne. 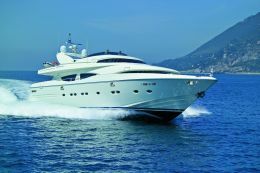 This motor yacht has a length of 33 metres and a breadth of 7.60 metres, and is equipped with a pair of 2,000 HP MTU's enabling it to reach a maximum speed of 29 knots. Since June the Base Nautica Falvio Gioia has at disposal 15 berths for yachts of up to 50 metres. Situated in the Gulf of Gaeta, the Base Nautica Flavio Gioia has been granted a concession for use of the outer jetty of the harbour by the Port Authority of Civitavecchia- Fiumicino-Gaeta, so that even superyachts can now come alongside at only a short distance from the old town centre and shopping area. The depth of the water at the 15 berths now added to the pre-existing facilities exceeds 6 metres and there is plenty of room to manoeuvre, providing ideal conditions for both motor-yachts and sailers of up to 50 metres. The lawsuit lasting over two years and involving Mrs Trump and the former skipper of her M/Y "Ivana" has drawn to a close. The skipper had claimed benefits of various kinds and damages due to his dismissal without notice and damage to his image as a result of his early release from the job. Having accepted the arguments of the defendant Mrs. Trump, represented by her attorney Giovanni Scognamiglio, the Court found that in this specific case the employee-employer relationship between the owner and the crew of a leisure craft flying a foreign flag did not fall within the jurisdiction of the Italian magistrates. Although the skipper had first boarded the yacht in Italy and it had been berthed at length in the port of Sanremo, the employment relationship had to be considered as taking place abroad. In reaching this decision, it was felt that what was important was the place of acceptance of the proponent was important, and this was outside Italy. Athena or the goddess of war, but also she to whom mythology entrusted the invention of ships. This is clearly why the choice fell on this name for the new 90-metre schooner that the Dutch shipyard Royal Huisman will be delivering to a lucky owner precisely in September. While waiting for the opportunity to show you every amazing detail of the boat - "Superyacht" will publish a report on it in the next issue of the magazine - here is a picture of the recent ceremony held when this three-masted ship left the hangar inside which she was built. We attended the event and, to tell the truth, were absolutely fascinated. See you soon, Athena. Metaxa Marine and Mondomarine have reached a co-operation agreement for building superyachts. 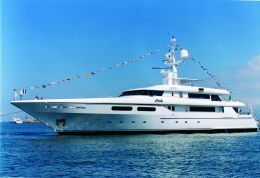 Metaxa Marine have undertaken the construction of a 42-metre motor-yacht, expected to be launched late in 2005 under the name of "Kimberly II". It will be a displacing yacht, the naval architecture side of which has been entrusted to Professor Ruggiero, and it will be motorised with a pair of Caterpillar engines, thanks to which it will be able to sail for 4,500 nautical miles at a speed of 12 knots.